The basic recipe for these tarts came from the Rose Bakery Cookbook. I saved time by making the tart dough the day before and freezing it. Preheat oven to 350 degrees and grease tartlet tins with butter. In a food processor, mix flour, sugar, butter and salt until the mixture looks like breadcrumbs (ten seconds). Put the mixture in a bowl and make a well in the middle to add the eggs and vanilla. Stir to incorporate the flour and then use your hand to mix the ingredients well. Remove dough to a dusted work surface and knead a few minutes until it is smooth. Put dough in fridge for at least an hour to cool it. 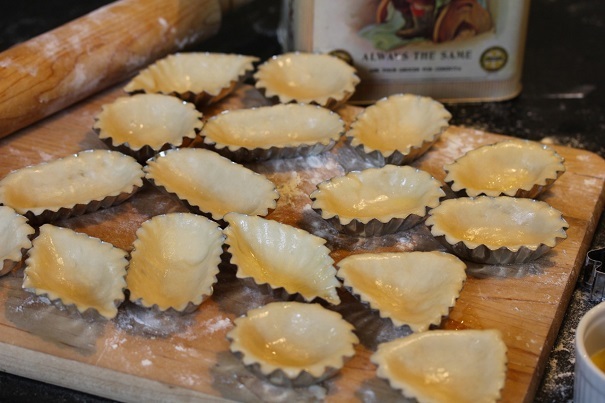 Roll out dough to ¼ inch thickness and, depending upon the size of your tartlet tins, cut dough into shapes that roughly approximate the shape of the tins. Tamp the dough down into the tins, gently pressing down until the dough smoothly lines the tin. Cut the dough off at the edge of the tins. Put tartlets back in the fridge and cool for 30 minutes before baking. 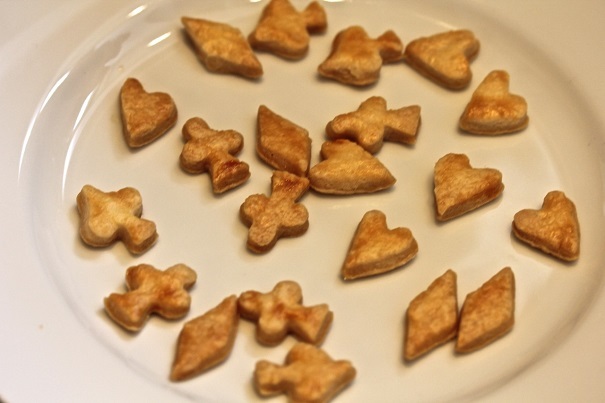 Fill tartlets with pie weights and bake for 5 minutes. Cool before filling. 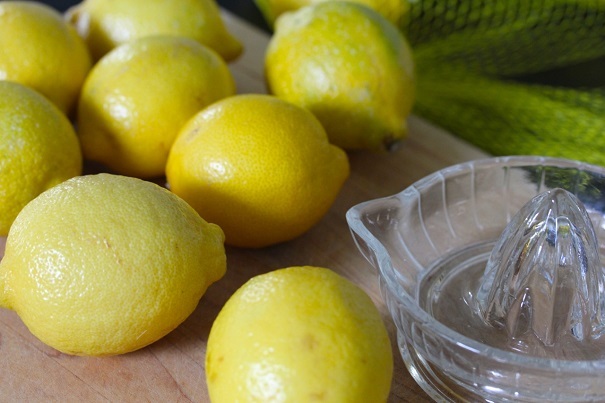 Whisk lemon juice and sugar until well mixed in a medium bowl. Beat in the eggs and egg yolks, one at a time. Add the cream and whisk well, then add the flour. Strain the mixture. 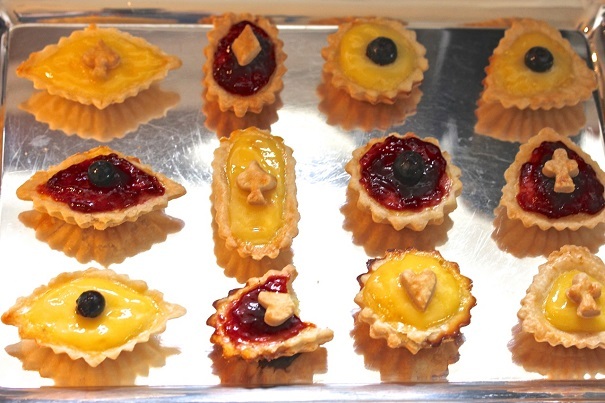 Before pouring into the tartlet cases, brush the tartlets with a beaten egg glaze to keep the dough from becoming wet. 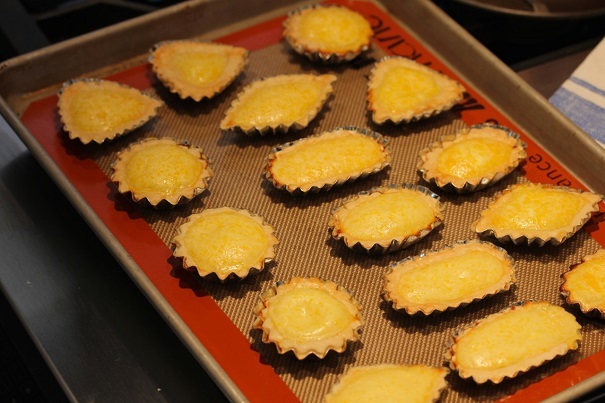 Pour the lemon mixture into the tartlet cases until they are 2/3 full (they will rise). Bake for about 30 minutes, then allow to cool. For the lemon curd, put the eggs, egg yolks, sugar, and lemon juice in a small saucepan and, stirring constantly at medium heat, cook until the curd thickens. Remove from heat and stir in the butter. Strain into a bowl and cover (keeps in fridge for a week and is delicious on biscuits, scones and gingerbread.) When curd has cooled in fridge, spread over the lemon tartlets and serve. Can be garnished with blueberries, or little cutouts of the tartlet dough. 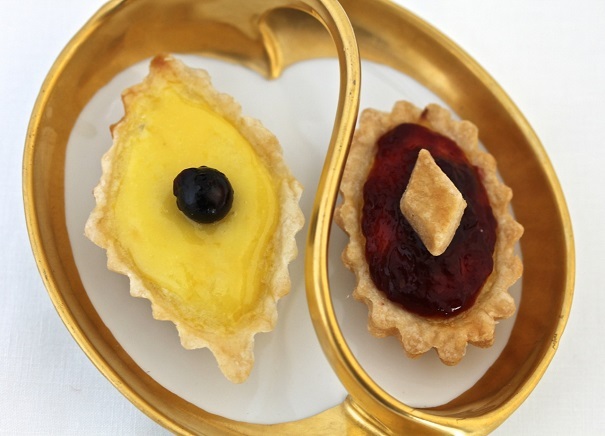 For the blueberry-jam glazed tartlets, substitute blueberry jam for lemon curd. Melt jam in small saucepan over low heat until it softens, then brush on tartlets with a pastry brush. Tartlets are best if served on the same day they are made.